Reigning WBC United States (USNBC) Champion Lanardo Tyner is set to face Angel Hernandez for the vacant World Boxing Union (WBU) Welterweight World title, at the Masonic Temple in Detroit, Michigan this coming Friday. Tyner won the USNBC National title with a sensational first round stoppage of Charles Hatley in August 2012. The Houston, Texas based fighter then went on to successfully defended his crown in May last year, with another stoppage victory, this time with just seconds remaining of the final round against Tyrese Hendricks. Tyner comes into the fight with a wealth of Championship experience under his belt, having previously secured the USA Mid American Light Welterweight, USA Texas State and USBO Welterweight titles, as well as challenging for USBA, NABF and NABA titles on a number of occasions. With nineteen of his wins coming by way of stoppage, including four TKO victories in his last five outings, Tyner is without doubt the bookies favorite, however don’t go writing his opponent, Gary, Indiana’s Angel Hernandez, off just yet. Hernandez may be deemed to be the underdog. having had only two championship bouts during his twenty nine fight career, but like Tyner, Hernandez also has a fearsome knockout reputation, having stopped thirteen of his opponents inside the distance. In his last three fights Hernandez scored a third round knockout victory over Ahmad Cheikho, a close split decision loss, against Purnell Gates for the USBO Light Middleweight title and a sensational first round stoppage win over Starr Johnson. Another factor is Hernandez was born in Detroit, so will without doubt have the local crowd well and truly behind him in his quest for the World crown. 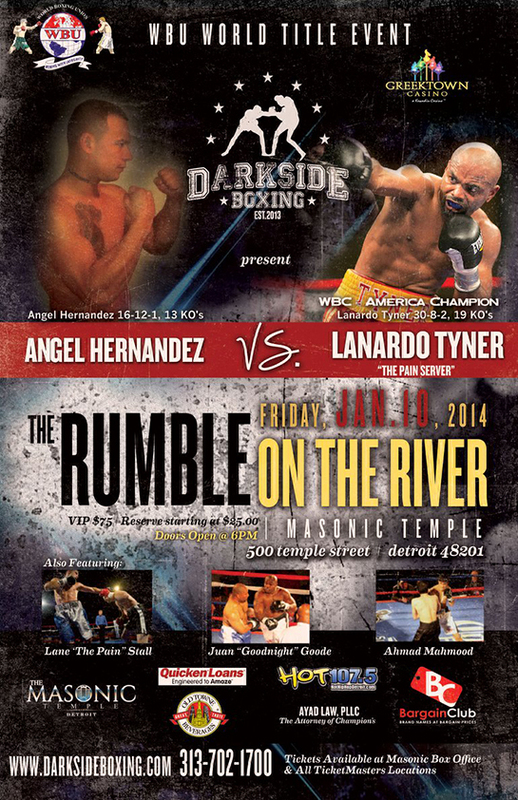 Angel Hernandez versus Lanardo ‘The Pain Server’ Tyner, for the vacant World Boxing Union Welterweight Title, headlines the Naser Beydoun’s Darkside Productions promoted RUMBLE ON THE RIVER event, at the Masonic Temple in Detroit, Michigan on Friday 10th January 2014. Please go online to www.wbuboxing.org or www.wbueurope.eufor additional information on upcoming WBU and WBU Europe sanctioned title fights.